Tim Bowen Antiques, Carmarthenshire, Wales The Church & Black Lion at Llanbadarn Fawr by Alfred Worthington. The Church & Black Lion at Llanbadarn Fawr by Alfred Worthington. An unframed primitive oil on canvas by Alfred Worthington of Aberystwyth. Back of canvas stamped Wneatley Aberystwyth. Born in Kent, Alfred Worthington moved to Aberystwyth in 1870 and worked as a photographer. But he became better known for his paintings of Aberystwyth and the surrounding area, in particular his marine paintings. He produced many hundreds of oil paintings for both the local and the tourist market. 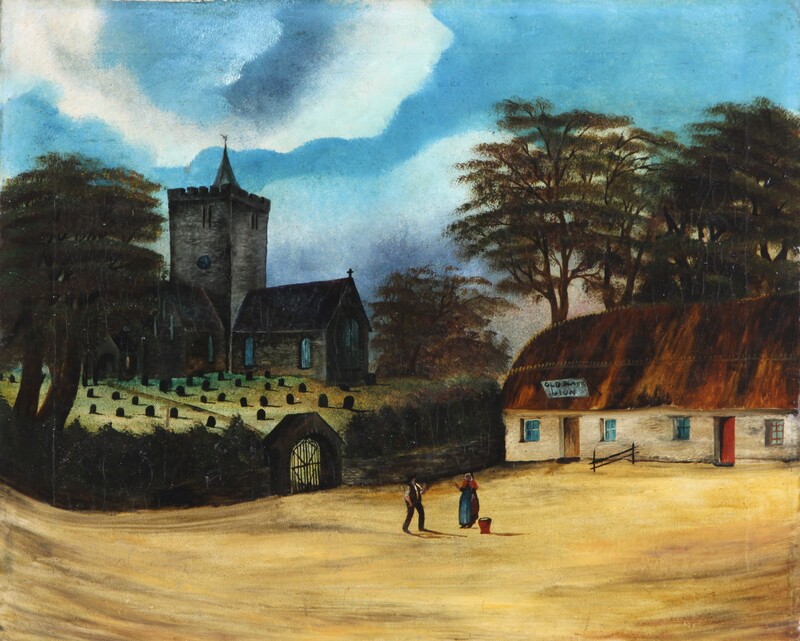 The church and Black Lion at Llanbadarn Fawr near Aberystwyth was one of the most popular scenes that he painted. A collection of his works is held at Ceredigion Museum Aberystwyth.